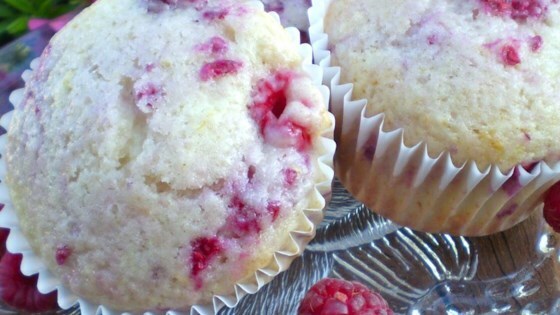 "This is the perfect muffin - really yummy flavor yet not much sugar. I've used different fruits too - blueberries and raspberries are our absolute favorites, but strawberries, peaches, or cherries are good too - frozen or fresh. You can use any kind of yogurt without fruit on the bottom. Easily adaptable to what you have. Hope you enjoy!" In a large bowl, mix together the yogurt, oil, lemon juice, egg whites, and, if using, lemon extract. In a separate bowl, stir together the flour, 3/4 cup sugar, baking powder, salt, and lemon zest. Add the wet ingredients to the dry, and mix until just blended. Gently stir in the frozen raspberries. Spoon batter evenly into the prepared muffin cups. Sprinkle remaining sugar over the tops for decoration, if desired. Excellent muffins! I used one whole egg instead of the egg whites, and they turned out fine. This recipe is so great, I can't believe it is low fat! I made mini muffins & they took about 10 to 12 minutes to bake. I definitely recommend this one!